Many people don’t understand the difference between Alzheimer’s disease and dementia. Dementia is a general term that describes a decline in mental ability that interferes with daily living. Alzheimer’s is a specific condition and is the most common form of dementia. According to the Alzheimer’s Association, up to 80% of all dementia cases involve Alzheimer’s. Vascular dementia is the second most common form of dementia and is a condition that usually occurs after suffering from a stroke. Other forms of dementia can be triggered by thyroid problems and vitamin deficiencies, just to name two. These types of dementia are said to be reversible since the underlying causes can be treated with established medical care. To help increase your awareness of Alzheimer’s, and in honor of Alzheimer’s Awareness Month, here are 10 warning signs that the disease might be affecting you or your loved ones. 1. Memory loss that disrupts your daily life. This could mean that you forget information that you have recently learned, such as the date, or time of an appointment. You may find yourself asking for the same information over and over again. You may find that you need to rely on memory aides. 2. Difficulty solving problems or following a plan. You might lose your ability to follow a recipe or keep track of your monthly bills. 3. Difficulty concentrating. You might find that it takes longer to do familiar tasks. You might not remember how to drive to a familiar location or how to use the settings on the microwave. 4. Confusing the time and place. You may lose track of dates, the seasons or even the passage of time. You might forget why you are in a specific place and how you got there. 5. You might lose your ability to judge distances and to distinguish color or contrast. It becomes increasingly difficult to understand visual images and spatial relationships. 6. Problems with words when speaking or writing. It may be more difficult to follow a conversation or join in. You might find yourself stopping in the middle of a sentence or repeating yourself. 8. You might lose your ability to exercise judgment or make sound decisions. Giving large amounts of money to a stranger who solicits over the phone or the Internet is one common example of this type of behavior. 9. Withdrawing from social activities is another common symptom of Alzheimer’s. You might find it difficult to participate and remember the rules of a favorite activity. 10. Changing moods and personality. 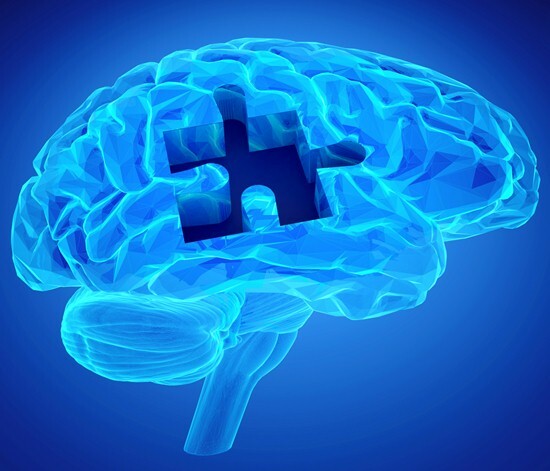 Alzheimer’s symptoms can include feeling confused, suspicious, anxious or depressed. To help stave off some of these signs and symptoms of Alzheimer’s, here are six alternative remedies that could protect your brain from cognitive decline. Blueberries are full of antioxidants which slow down age-related motor changes in the brain. Add some of these delicious berries to your breakfast every morning. Drink filtered or bottled water. Tap water may contain chemicals that damage cells in the brain and lead to cognitive problems. Eat orange veggies like carrots, bell peppers, and squash that are high in beta carotene. Beta-carotene is needed to boost vitamin A levels. Vitamin A plays a role in protecting nerve and memory function. Eat lots of fish. Fatty fish, such as salmon and sardines, contain high amounts of fatty acids that boost brain function. Eat dark green leafy vegetables every day. Eating some spinach, kale, parsley or collard greens could boost your intake of folic acid. Folic acid is needed to promote healthy brain function. “Alzheimer’s and Dementia,” Alzheimer’s Association web site; http://www.alz.org/alzheimers_disease_1973.asp, last accessed Nov. 21, 2013. Brendan, J., “Alternative Medicine for Alzheimer’s Disease,” Neurologist. September 2008; 14(5): 299-306.